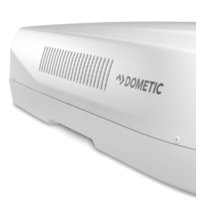 The All New Dometic IBIS 4 Caravan Air Conditioner - What's all the fuss? If your Caravan Air Conditioner does not have a dual piston compressor with inverter technology, then you are missing out on the potential to enjoy a quieter operating Air Conditioner that uses a significantly lower amount of power to operate compared to a traditional Caravan Air Conditioner. Put simply having dual pistons better balances the compressor operation reducing vibration and noise whilst improving the overall life of the compressor. Inverter Technology allows the compressor to ramp up and ramp down in a controlled fashion to meet the cooling or heating requirements demand. Gone are the days where your compressor kicks in, runs flat out, and then stops for a period before kicking back in again. This means you enjoy a quieter nights sleep as the compressor is a lot quieter when it is ramping up and ramping down instead of starting and stopping constantly. If you are an extremely light sleeper, try using the sleep mode function which allows you to slow the compressor down even further and at a constant regulated speed for an overall more quiet operation. Power consumption is significantly lower using a controlled, variable speed compressor which means the Dometic IBIS 4 can be run from a suitable lithium battery setup in the event you want to travel 'Off-Grid'. The new Dometic Ibis 4 has an adapter that makes retrofitting your existing air conditioner no problem at all. 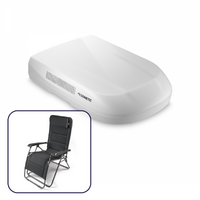 Most caravan or RV air conditoners are made to suit either an American style 360mm x 360mm or European style 400mm x 400mm sqaure roof cutout. The universal adapter that comes with this unit will suit both sizes which can save you time and money by not having to alter the size of your existing cutout. The physical size of this unit fits into the 'low profile' category at only 230mm in height and weighing in at only 40kg, the Dometic Ibis 4 is suited to most caravans, poptops and Rv's currently on the market without any extra support needed, although it is a good idea to support the weight of any airconditioner that is installed on the roof. Some caravan manufacturers provide inbuilt roof support as standard, otherwise you can install an external 'H-Frame' support on top of your roof that will give you peace of mind that your roof structure will stay intact. Heres a snap shot of the technical stats comparing the existing market leaders in caravan air conditioning. The Ibis 3 is a very popular choice for caravans with an existing 360mm x 360mm roof cutout, while the FreshJet 3200 caters for the 400mm x 400mm roof cutout market. Now with the New Ibis 4 available, it will be hard to settle for anything less. The IBIS 4 is definately more than capable to operate in the hottest parts of Australia. Designed to operate between ambient temperatures of -2 to 52 Degrees Celsius - this unit will keep you cool or warm when you need it most. Here at Caravan Rv Camping, we fit all our accessories that we offer. Simply give us a call on 1800 787 278 to talk to an expert who can give you an approximate quote and book you in for an installation. Otherwise if you are going to fit yourself, here is an installation guide on how to fit the new Ibis 4 Airconditioner. This is the universal adapter that comes with unit. Designed to fit into your 360mm x 360mm or 400mm x 400mm square roof cutout depending on which way the adapter is installed. What is the operating temperature range of this Air Con?